Salford Junction is one of the few junction where you can cruise in four different directions. The Birmingham & Warwick Junction Canal, part of the Grand Union Canal, leads to Bordesley Junction and eventually, after 221 kilometers (138 miles), the River Thames at Brentford. 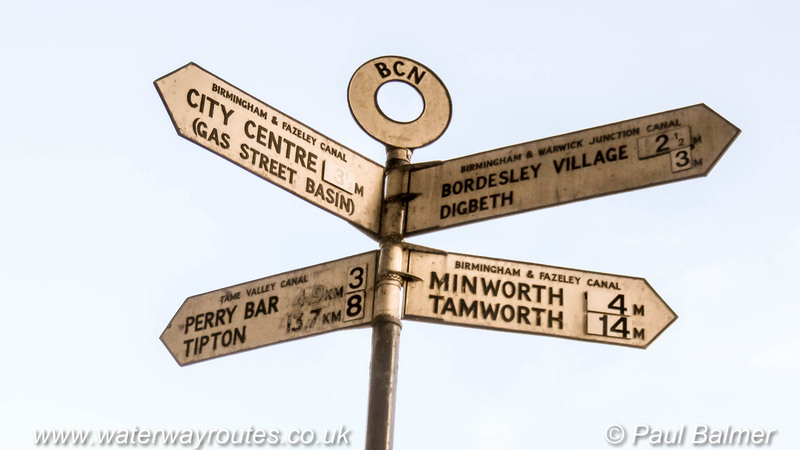 The Birmingham & Fazeley Canal passes through the junction on its route from Birmingham to Fazeley, and on to Whittington. The Tame Valley Canal, part of the Birmingham Canal Navigations, leads to Rushall Junction and on to Tame Valley Canal where it meets the Walsall Canal. A mischievous person has modified the sign so it shows distances in miles rather than kilometres.